In this example we look at a DHT PRO example in Micropython for an ESP8266. Once again we use uPyCraft and again we use Wemos shields. 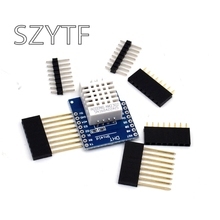 AM2302 capacitive humidity sensing digital temperature and humidity module is one that contains the compound has been calibrated digital signal output of the temperature and humidity sensors. 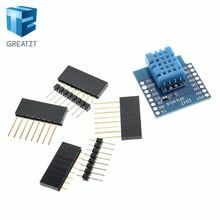 Application of a dedicated digital modules collection technology and the temperature and humidity sensing technology, to ensure that the product has high reliability and excellent long-term stability. 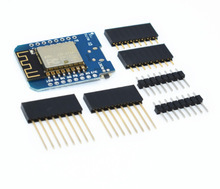 The sensor includes a capacitive sensor wet components and a high-precision temperature measurement devices, and connected with a high-performance 8-bit microcontroller. I connect the Wemos Mini to the dual base and then put the DHT shield along side this, you can connect the Wemos DHT shield directly to the Wemos Mini if you want. In this example we look at a DHT11 example in Micropython for an ESP8266. Once again we use uPyCraft and again we use Wemos shields. In this example we will use the original DHT version 1.0.0 shield which was based on the DHT11 . Later shields use the DHT12. The DHT11 digital temperature and humidity sensor is a composite Sensor contains a calibrated digital signal output of the temperature and humidity. Application of a dedicated digital modules collection technology and the temperature and humidity sensing technology, to ensure that the product has high reliability and excellent long-term stability. 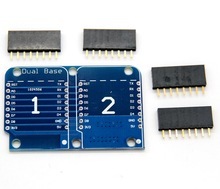 The sensor includes a resistive sense of wet components and an NTC temperature measurement devices, and connected with a high-performance 8-bit microcontroller. In this example we show an example written in Micropython using the uPycraft IDE. 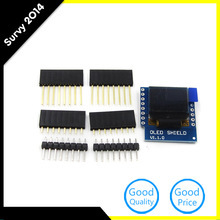 This time we will be trying out the Wemos OLED shield connected to a Wemos Mini. I connect the Wemos Mini to the dual base and then put the OLED shield along side this. You can connect the OLED shield directly to the Wemos Mini if you want. This is a simple very short code example in which we show how to create a basic I2CScanner in Micropython using the uPyCraft IDE for an ESp8266.